Resolutions and proposed constitutional amendments must be received no later than July 9th, 2019. A copy of the convention resolutions book will be posted on CUPE’s website 30 days prior to the convention. Please refer to here for resolution format and recommended procedures or see the Advance Notice PDF below. 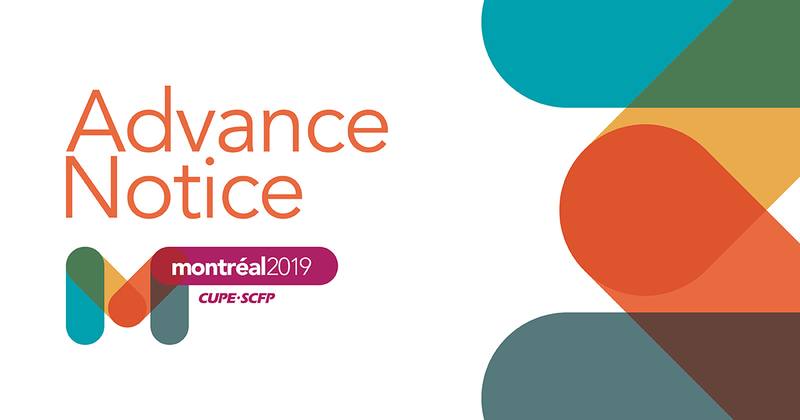 The 2019 CUPE National Convention convention will be held October 7 to 11, at the Palais des congrès de Montréal, Montréal, Quebec. This advance notice of the convention is being sent simply to allow your organization to plan accordingly. The official call for the 29th CUPE National Convention (along with credential forms) will be emailed to you by JULY 9th. Registration for the national convention will not open until AFTER the official call and credential forms are sent in July. All nominations must be completed no later than July 9, 2019.